10 super-secret methods ANYONE can use to make up to $2,000+ in a single weekend... from your home, with nothing but an internet connection and a few hours' spare time! 5 "brain-dead-simple" work-from-home jobs you've probably never even heard of that could allow you to earn thousands of dollars per month essentially doing nothing! The #1 threat to US citizens over the next 24 months practically NO ONE sees coming... This unstoppable force will either make or break millions of Americans! I only have 412 copies to give away today! Have you ever wondered why it's become nearly impossible to earn enough money to create a decent life for yourself nowadays? ...Why it's become so much more difficult to save money... or even keep up with your bills than it was 20 or 30 years ago? Do you lie awake at night worrying about the debt you've accumulated from student loans, mortgage and credit cards? Are you afraid you'll never be happy with your job -- or that you'll grow old and never have the time or money to do the things you've always wanted? THE RULES OF CREATING WEALTH IN AMERICA HAVE CHANGED! America is changing in profound ways. ...A book I believe could help you create the life of your dreams -- even if you're 85 years old and have exactly ZERO DOLLARS in your bank account. I was one of the original investors in the popular ticket-buying company "Ticketfly" with one of Silicon Valley's most famous venture capital firms. I'm currently up 3,600%. ...And I believe that once you learn these secrets, you will NEVER have to worry about running out of money again -- even if you have $0 in the bank. I think this book is so important, in fact, I used my connections in the publishing industry to get you an amazing deal. In short, I want to send you a copy FOR FREE. But first, let me tell you why this book is so incredibly valuable to you RIGHT NOW. The five "Cubanisms" for thinking and investing like a billionaire... Most people don't know this about me, but I personally had a hand in helping Mark Cuban earn his first $1 billion in the late '90s... and through it all I learned five critically important things that have helped me make millions over the years too. On page 260 I'll tell you about the wealth-creation secrets I learned from America's most famous entrepreneur, and how you can use them to create your own fortune in record time! Click Below to Claim Your Copy, While Supplies Last! The "Magic Abundance Equation" I learned from multibillionaire Elon Musk... If you'd like to live an abundant life and never have to worry about money, there are two vitally important things that you need... Combined, I like to call them the "Abundance Equation," and on page 136 I explain what they are and how both myself and Elon have used them to create a fortune and a worry-free life. The #1 financial trend that will make or break American citizens in the next decade... I sat on the board of a $1 billion company in the employment sector, and I saw firsthand a trend sweeping America that will have a devastating impact on workers and retirees everywhere. This trend will revolutionize the way many of our biggest industries operate... It will bankrupt many, but it could make anyone who is prepared extremely wealthy. You will be SHOCKED when you learn my advice and specific actions about how to prepare... and even make money. (Page 13) Click Below to Claim Your Copy, While Supplies Last! The "Hub and Spoke" method for easily making $1 million+ a year online... Chances are, you've seen a lot of young Millennial "gurus" out there that claim to know how to make millions online... but the truth is, most of them are still living with their parents and trying to make a few extra bucks. Fortunately, with my lofty connections, it wasn't hard for me to track down one of the entrepreneurs that REALLY makes over $1 million per year online from the comfort of their home. On page 321, I'll tell you about the little-known "hub and spoke" method that almost anyone can use to create a massively successful online business! Three vital lessons about success I learned from one of the highest-paid actors in the world... His dad was an alcoholic, his mom was mentally ill from syphilis and institutionalized when he was a child... and he dropped out of school at 13 and joined the circus to pay the bills. Despite his dark past, this actor went on to found his own movie studio, which became one of the biggest in Hollywood history. On page 362, I reveal three important lessons I've learned from this famous actor that have helped me make millions of dollars! The "Bruce Lee" Technique for mastering the art of income generation... In the past 30 years of teaching people and being forced to come up with money under pressure, I have discovered what I believe is the best method for learning how to generate income extremely quickly. I call it the "Bruce Lee Technique," and it's what I fall back on every time I find myself in a tight situation and need to generate income FAST. On page 369 I talk about one time in particular when I was the CEO of a company that was about to miss payroll and how this technique saved my business... (This skill is vitally important for anyone that wants to generate extra income in America!) Click Below to Claim Your Copy, While Supplies Last! The Larry Page secret to making $45 billion... According to Forbes, Google co-founder Larry Page has a net worth of $45 billion. I've learned a lot of lessons from Larry about success in business and how to accumulate wealth. On page 297, I'll share 23 of the best pieces of advice I got from Larry that could help you create a fortune and a worry-free life! ...And I've distilled the best lessons I've learned into this valuable book. Look, I know there are a million "experts" out there that are claiming they can teach you how to earn income in America. But how many of these self-proclaimed "gurus" have created millions of dollars on a shoestring budget as many times as I have? My point is, it's going to be up to YOU to generate the income you need to live the life you want in the new American economy. And it's far easier to do than you ever thought possible! In fact, I'd say that right now is the greatest opportunity you will ever have to accumulate a fortune and create the life that you want. Reinvent Yourself will show you exactly how. I have a hardcover copy of Reinvent Yourself reserved in your name, and I'm prepared to send it to your doorstep today, free. Click Below to Claim Your Copy! "Highly Recommended for Self-Improvement and Earnings..."
I have read several of Mr. Altucher's articles and books before. This is the most complete one I've read to date. If you are serious about improving your chances for growth and earnings, it's a must-read. 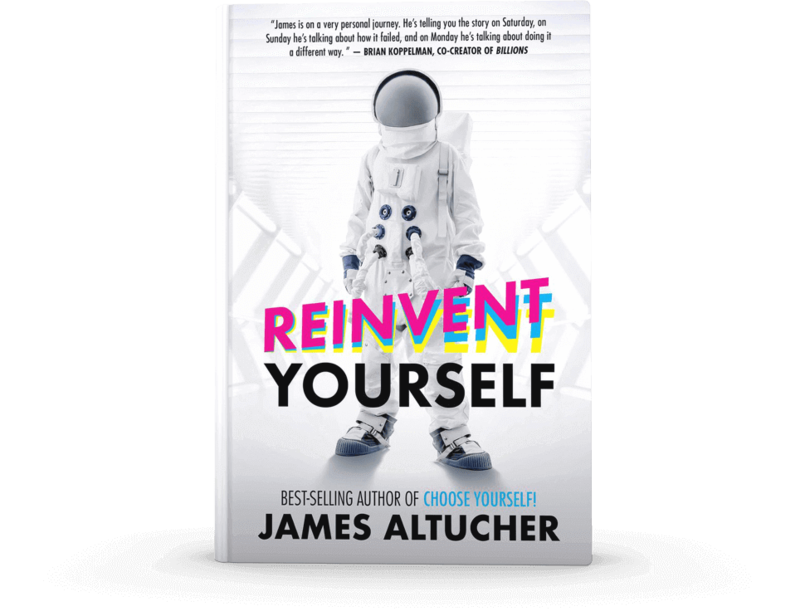 Another great book by James Altucher. James distills ideas he's learned from his experiences and meeting tons of interesting people. I would recommend this book to anyone who wants a roadmap of the way the world is headed. 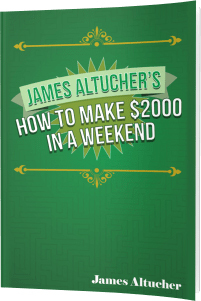 James Altucher's advice has made me money, period... His books are fast reads packed with tangible info. 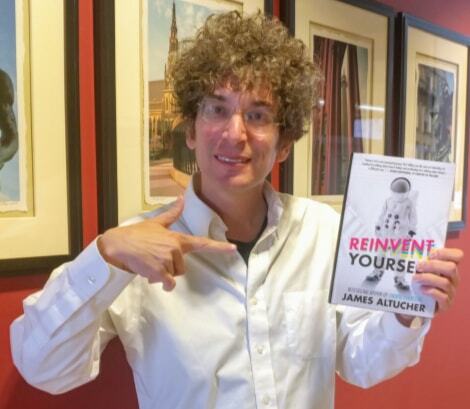 "If I Hadn't Found James' Writings, My Life Might Look Very Different..."
Forbes Article: "James Altucher: The Most Interesting Man in the World"
"James Altucher Changed My Life..."
James Altucher changed my life with his blog and books. Give him a try, I'm sure it'll do no less for you. You Will NOT Find a Hardcover Copy of This Book Anywhere Else in the World! But I've set aside a small number of limited-edition hardcover copies of my book as part of this special deal. 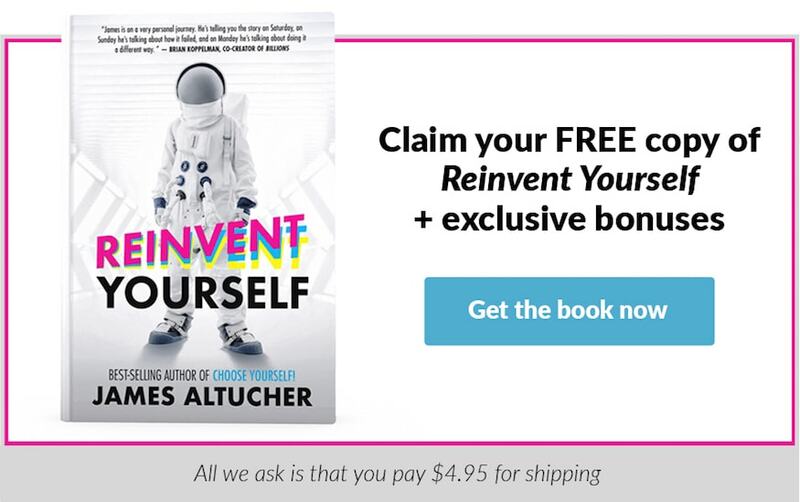 In other words -- this is the only place in the world where you can claim a hardcover copy of Reinvent Yourself absolutely free. who wants to create extra in the new American economy. "James shows readers how they can succeed despite their flaws, not because of a lack of flaws. This is hugely refreshing in a world of rah-rah positive thinking gurus who are all forced smiles and high-fives." "What I like about James and his book is you can tell he came from a roller coaster. He chose his own path to success without knowing the outcome. And what happens to him later -- well..."
"James is on a very personal journey. He's telling you the story on Saturday, on Sunday he's talking about how it failed, and on Monday he's talking about doing it a different way." I've done everything in my power to make this offer a "no-brainer" for anyone that would like to generate extra income in America. These bonuses are the perfect "addendums" to Reinvent Yourself, and they are practically certain to increase your chances of success dramatically. How to Make $2,000 in a Weekend! Need income in a pinch? In this valuable 150-page digital guidebook, I reveal the top 10 easiest PROVEN ways to potentially generate $2,000 or MORE in a single weekend. These are the income-generating secrets that I discovered from the CEO of a $500 million company that can dish out thousands of dollars to regular Americans like you and me, every single day. The best part is many of these methods require skills that you already have or that you can learn in a matter of weeks from the comfort of your home. ANYONE with an internet connection and a few hours’ spare time can do this. I’m not talking about doing anything hard or ridiculous either. Some of the methods I recommend require almost no money or special skills to get started. In fact, one of the methods involves nothing more than simply reading a script into a microphone… and you can make thousands of dollars doing it! Sadly, most Americans have no clue these opportunities even exist. But I reveal the 10 most profitable — as well as my four favorites — with instructions on how to get started on each one in this report. If you'd like to earn money without ever having a conventional job, this second bonus report is perfect for you! In it, I talk about five lucrative "work-for-yourself" part-time gigs that almost anyone can do to generate extra income on a monthly or weekly basis. This is NOT a guide to finding a corporate job that will have you chained to a desk for hours every day... That goes against everything I stand for. ...You'll have the rest of the week to do what you like... Whether that's traveling, spending time with the family or just taking it easy. And the best part? No bosses, no payroll and no headaches. Every opportunity that I recommend in this report is fun, easy to get started, and has the potential to generate thousands of dollars each and every month. In fact, one of the "jobs" I recommend could easily earn you over a thousand dollars a month, and all you need is an internet connection, a phone and a few hours' spare time a week! There are already thousands of Americans out there making good money doing these things, and you've probably never even heard of them! If you accept this special offer today, you'll also receive my book The Choose Yourself Guide to Wealth. 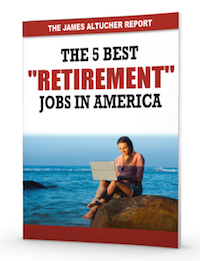 This 279-page book is jam-packed with some of my best financial insights and income secrets that I personally use to survive and thrive in the new American economy. 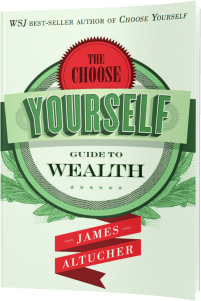 In short, The Choose Yourself Guide to Wealth includes vitally important information about creating and maintaining wealth in the "new America" that you won't find anywhere else. How to eliminate your debt in 30 seconds or less... On page 218, I talk about a secret method you can use to get rid of your mortgage, credit cards and student loan debt. It has nothing to do with declaring bankruptcy, moving or hiding your assets... and it's 100% legal. But I have to warn you... this strategy is NOT for everyone. How to use a tool I like to call the "Idea Matrix" to create your own income... and never rely on corporate America or the government again! I strongly believe that ideas are closely linked to wealth, and on page 19, I explain why learning my "Idea Matrix" could be the easiest, most surefire way to never have to worry about money again! "Since Buying Your Book, I've Quit My Job..."
I bought your book and was deeply influenced by your insights at a point in my life where I needed change. Since then I have quit my job. Started a company and we are actually raising money. So just saying thanks, what you're doing matters." "Practical, Off-the-Beaten-Path Ideas for Wealth Creation... That Actually Make Sense"
This is a great book which covers many angles of personal finance and wealth creation that are not taught in most other books. James comes across as a genuine everyman, as he has suffered through his own ups and downs. Especially enjoyed his extensive exploration into the power of coming up with ideas every day, and making it a regular practice. "Highly Insightful and Powerful Advice on Building Your Own Wealth Streams..."
This book needs to be read thoroughly and seriously by anyone who wants to escape the rat race that has permeated our capitalist society and its cubicle culture. The author gives very profound advice on how to come up with original ideas, so that you can use them to become wealthy one day (instead of depending on someone else's paycheck for the rest of your life)... If you want to live a less stressful life because of money, then I highly recommend you read this book. The Choose Yourself Guide to Wealth is a perfect supplement to the material you'll read in Reinvent Yourself, and with it, your chances of success could skyrocket. 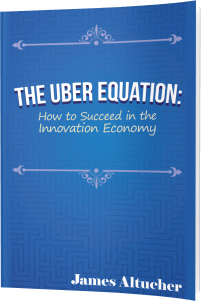 The fourth bonus you'll receive is all about how to succeed in what I like to call the "Innovation Economy." In it, I'll tell you -- step by step -- how I created a business that went from ZERO to six figures a month in under half a year... without hiring a single employee! Plus, I'll tell you how to cash in on the seven biggest trends and industries that I see developing over the next few years (almost nobody is talking about these)... and I'll cover over a dozen different ways to monetize them! In this incredibly valuable report, I'll also teach you the exact process I go through to come up with and implement new streams of income using my "PTO" method. ...And I'll even hand you a few "never-before-seen" ideas that each have the potential to make millions of dollars for anyone that takes the time to implement them. Remember, you can ONLY get these bonuses and your limited-edition hardcover copy of Reinvent Yourself by responding to this offer while supplies last. That's why I'd like to include a free 30­-day trial subscription to my monthly income and opportunity briefing, called The Altucher Report. My mission is simple: to help everyday Americans end their reliance on the conventional institutions... and learn how to create your own streams of income so you can live your life exactly how you want -- without EVER having to worry about money. Frankly, what I teach in this report is the only proven way that I know to survive and prosper in America these days. In the past, I've only provided this kind of research to my high-net-worth business associates and members of the Wall Street elite. Now, it's available to you. The Altucher Report is the perfect way to stay up to date on new income opportunities that arise in America, and potentially make a fortune for yourself and your family. "There Is Truly Some Great Information Offered Here..."
...The thing is, we see so many products that promise to be an asset to those who have that true entrepreneurial spirit. But, so many fail to live up to expectations. However, this certainly does not fall into that camp because there is truly some great information offered here. "You Owe It to Yourself to Provide Yourself With the Positive Vibes and Influence You'll Get From Reading the Words Contained in This Monthly Report..."
If you're a "doer" rather than a "don'ter," a "go-getter" or a "wanna-haver," then you owe it to yourself to provide yourself with the positive vibes and influence you'll get from reading the words contained within this monthly report. And it doesn't matter what age you are, whether you're male or female, rich or poor, working, retired or unemployed -- all that's required to take advantage of the info provided is a positive attitude -- it's as simple as that! "He Provides a TON of Value..."
Well, I figure this package -- what essentially amounts to a free sample of some of my most important work -- is the perfect way to introduce you to my group and the research I do. If you like my work as much as I think you will, then my sincerest hope is that you'll want to do business with me again in the future. But of course, that will be totally up to you to decide. In short, I'm confident my work will speak for itself. That's why I am thrilled to send you this valuable research package for the ultra-low price of $4.95. If you're unhappy for any reason during the first 30 days, simply call my friendly Baltimore-based customer service staff and cancel. You'll never be charged another cent. If you like what you see, simply do nothing. 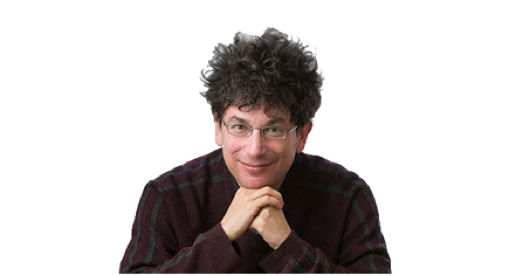 We'll bill your card for $99 for a one-year subscription to The Altucher Report after your 30-day free trial is over. I've printed a limited number of hardcover editions of Reinvent Yourself. I've reserved one in your name, but I can only hold it for you while supplies last. So if you're interested, I only ask that you please act soon. REMEMBER: These limited-edition hardcovers are not available on Amazon.com or at any other bookstore. You can only get them right here. Click the "Reserve Now" button below to get started today. This will take you to a secure order form page where you can review the details of your order and provide the details of where you'd like your books and research sent. The bonus reports will be sent to you electronically, within minutes of placing your order. A hardcover copy of Reinvent Yourself (Limited Edition) will arrive shortly after. P.S. I almost forgot. There's one more important gift I'd like to include as part of this deal. I've sold over a million copies of my different books online -- as far as I know, I've become the most successful self-published author in history -- and I firmly believe that everyone has the content inside of them to write a book. In my report The Ultimate Guide to Self-Publishing, I'll give you a step-by-step blueprint to write your own best-selling book. I'll tell you the exact self-publishing process I go through... including how to choose a title, how to design a cover, how to digitally publish it for Kindle and MUCH more. Everything you need to know to turn a rough idea into a masterpiece is in this special report, The Ultimate Guide to Self-Publishing.